Haunts: Five haunted houses and five Terror-tories. Price: $69.00 + tax online admission for Fun Card with Howl-O-Scream included. Haunted Attraction Price: FREE with park admission. Dates: Friday, Saturday & Sunday nights from Oct. 3 – 31. Jamie: Howl-O-Scream started off with elements of horror surrounding the entrance of the park and quickly drove you deeper into a nightmare. The terror-tories throughout the park provide a preview of what’s to come for each haunted attraction in the park. The actors do not play nice and do not like when you try to take a selfie with them. Each haunted house had their own unique theme and provided more scares than I could count. Their new attraction “Unearthed,” provided for an entirely new experience and a backstory that was developed by Blair Witch Project Executive Producer, Robin Cowie. The elements comprising Howl-O-Scream feature photo-opportunities at every corner while providing jump scares and fun for everyone. In conclusion, if you are seeking a well rounded haunted experience, SeaWorld Howl-O-Scream provides a horrifying experience that you will never forget. Sarah: Howl-O-Scream is a juncture for the family, with younger children wishing to experience some spooky magic with their scares, the singing and dancing. It’s a delightful mix are sure excite kids of all ages. The haunts provide scares to the whole family and provide a unique experience like no other. The multiple haunted houses provide creative storylines and visuals while still keeping true to SeaWorld’s familial core. Scary twins in one of SeaWorld’s Terror-tories. Haunts: Five haunted houses and four scare zones. Price: $66.99 + tax — includes all haunted attractions and scare zones. 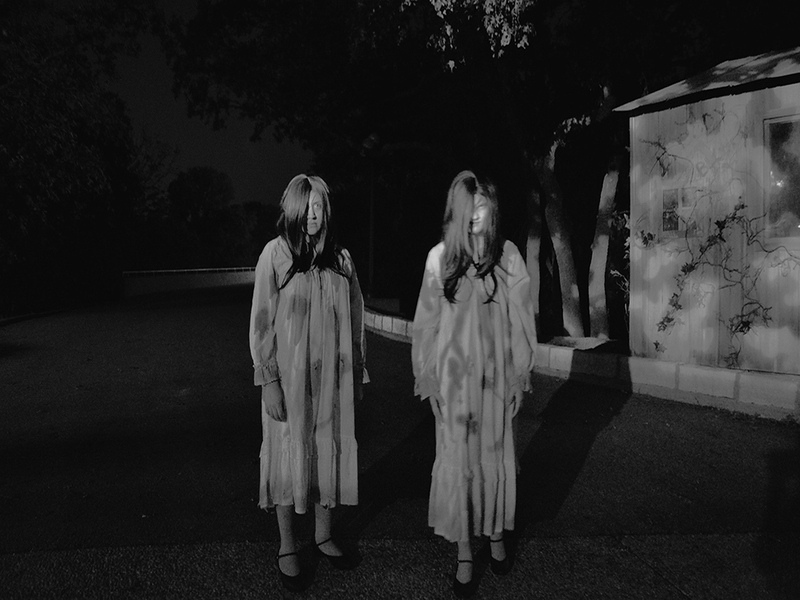 Dates: 14 nights of terror from Oct. 3 – Nov. 1. Jamie: Last year I started my Fright Fest experience by riding the Iron Rattler in the dark, this year I finally made it my tradition. Six Flags Fiesta Texas wants to scare newcomers and provides thrilling ride experiences and haunted houses, a combo of terror for the ultimate thrill-seeker. Their new haunted house “Slaughterhouse 6” had the entire group I was in jumping and screaming at every corner. The sounds of heavy machinery and chainsaws were not particularly happy sounds but we survived and I will definitely be going back. Their scare zones always pack a punch and provide for fun photo opportunities. My favorite of them all is Zombie Apocalypse. You step right into a mini zombie horror movie and try to proceed, which is great if you love zombies gnashing at you while you are taking a selfie. Sarah: Six Flags Fiesta Texas Fright Fest had a little more for the thrill-seeker with jumps, scares and fear factors. 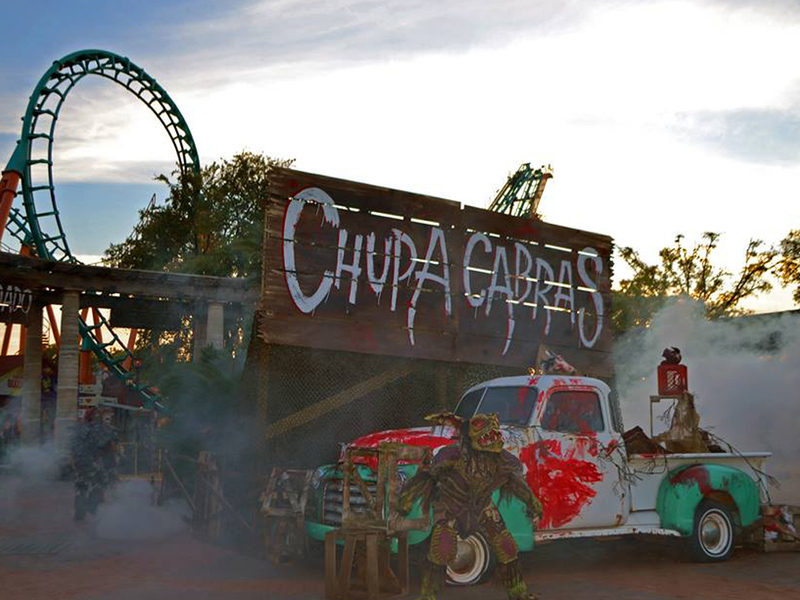 If the chupacabras, evil clowns and ghouls don’t put fear in your heart- hop on some rides like the Iron Rattler or the Superman rollercoaster for extra screams. I screamed so much during Slaughterhouse 6, I think I scared my group more than the creatures did. Haunts: One haunted house and one dark ride experience. Price: $20 + tax per ticket on-site. Haunted Attraction Price: Included with ticket price. Dates: Sept. 25 – Oct. 31. Jamie: If there is one thing that genuinely terrifies me in a haunted house it’s the anticipation for a jump scare. It’s an unnerving feeling that keeps you on your toes waiting for the next creature or noise to spring at you. 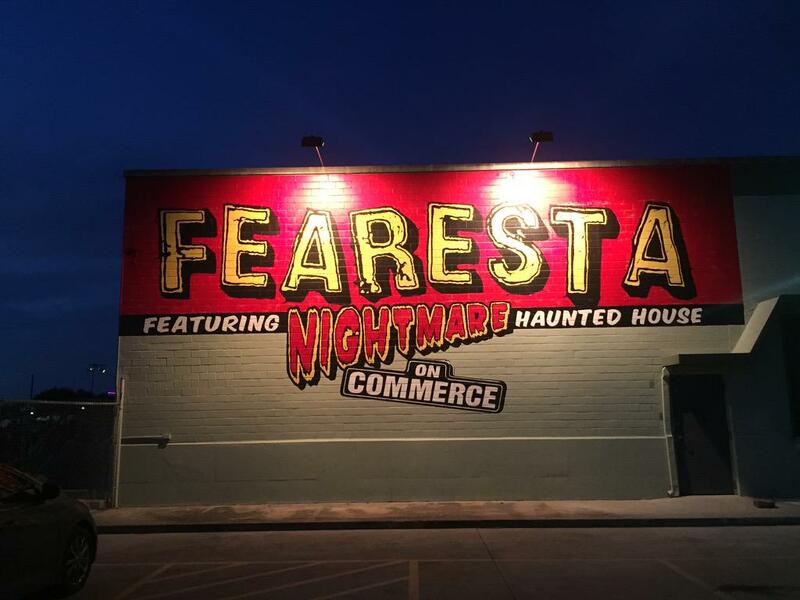 Fearesta delivers so many jump scares you will be walking on your toes as you exit the haunted house. To add to the anxiety I was already feeling in this house, it is very very dark. I had to hold my hands up a majority of the time so I would not run into things. One of the coolest aspects of Fearesta is they have a live performer doing insane acts including swallowing fire, walking on swords and laying on a bed of nails. I would recommend this haunted house if you are looking for big jump scares. Sarah: Fearesta makes a name for itself by tapping into everyone’s deepest phobias with a colorful cast of school children, werewolves and a gargantuan menacing pumpkin-headed monster to greet visitors. This haunt will play with your senses: fog machines, strobe lights, paired with a slanted maze to disorient your direction; making the scares and jumps even more apparent and unexpected. There’s even a call back to coney island’s sideshow freak spectacles with Roland Medina’s Feats of Danger, which will shock and amaze those with the most iron of stomachs. Price: $24.99 + tax per ticket. Dates: Sept. 25 – Nov. 7. 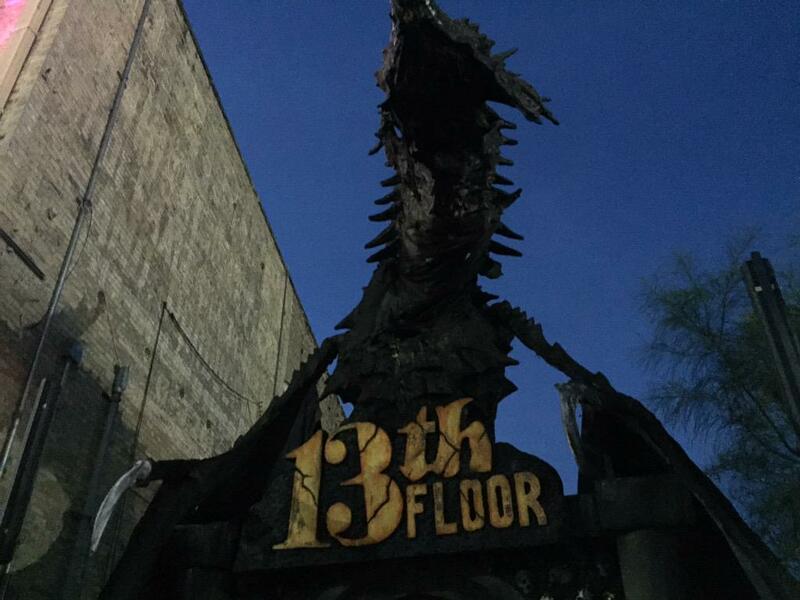 Jamie: Billed as one of the best haunted houses in America, 13th Floor delivered some truly horrifying moments. As you walk through the entrance you are greeted by disturbing creatures prodding at you until you step into the haunt. The set pieces were very well done and detailed while some rooms had me feeling sick and stumbling. What I liked best about 13th Floor was that it was a lengthy experience. They extended the haunt and added even more to it this year. There is so much to experience including random jump scares, creatures yelling in your face and monsters lurking in the walls. I will definitely be coming back to 13th Floor for another haunting experience. Sarah: 13th Floor is not for the faint of heart. This haunting maze pays close attention to its customer’s fears and anticipation. You will be watched, stalked and frightened the entire start to finish. 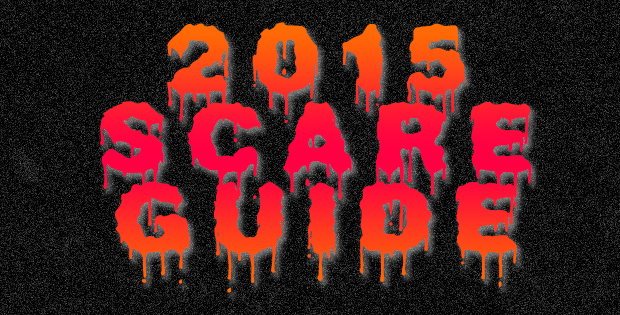 Definitely a staple for the San Antonio horror thrill-seeker. Bring the older children..if they dare. They may not escape, I barely did. Follow us on Twitter -CreativeMediaSA & Creative Socialite on Fb. Check out Six Flags Fiesta Texas Fight Fest here. Check out 13th Floor here. Note: Live music shows were not factored into this review. Reviews were based on haunted attractions at each location. These opinions and reviews do not reflect those of Creative Socialite and are based solely on each reviewer.